This weekend I had planned to ski further north, but time constraints and lack of partners placed me on the Southside of Mt Hood for a beautiful day. I started out just by myself but halfway up the Palmer I ran into a group of friends from TTips. One of them had accidentally dropped a glove a few hundred vertical feet back, so I offered to go down and get it and catch back up. As I was skinning back to meet the group I ran into a very nice lady from Seattle who turned out to be Lowell Skoog�s wife. I enjoyed her company while skinning and concluded that Lowell is a lucky man to have such a nice wife. Back with the other group we skinned to the top of the Palmer and then cut west to Illumination Rock. We skied below IR were the snow was very nice corn. The other group had a car parked at Paradise Park that they continued to. I cut back east to Tline around 8000�. The snow stayed great except for stickiness at the last part of the Magic Mile. Sunday was sure a beautiful day on Mt Hood.� Better than I expected. Steph mentioned meeting you on the Palmer snowfield. I would have enjoyed meeting you as well, but I was skiing the chairlifts with our son. Our party from Wenatchee, Everett and Seattle stayed at the Silcox Hut Saturday night. It was lots of fun as usual. 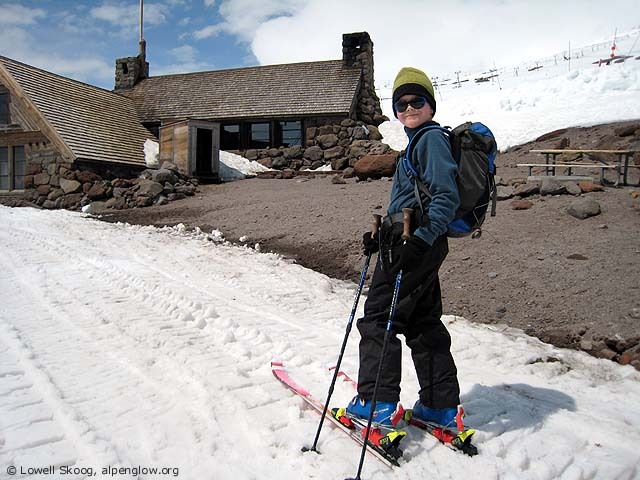 My 10-year-old son skied from Timberline to Silcox under his own power on Saturday. It was his second time on touring gear, the first being the TAY party a year ago. One of these days I'll set him up with some lighter gear. With his alpine bindings and Secura-fix adapters, his gear in the picture below weighed more than my outfit. But he made it!